Now you can achieve affordable All-In-One printer with functions like basic printing, copying and scanning functions. This printer can easily fit into even the smaller spaces and shelves in a home or your office. 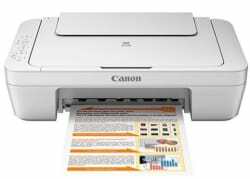 It features an Auto Power ON function which detects a print command and will automatically switch the printer ON with a USB connection. This printer includes software that automatically creates various appealing collages and calendars using the photos stored on a PC to make suggestions to the user. So print away all your exquisite creations this printer will turn each of them into masterpieces. Scanning Speed*8 Reflective: A4 Colour / 300dpi: Approx. 14secs. Copy Speed*10 Based on ISO / IEC 29183. Document: Colour: sFCOT / Simplex:Approx. 31secs.